The Munster football clash on 26 May is likely to come too soon for Paul Kerrigan and Sean Powter. Powter and Kerrigan set to be Cork absentees, O'Driscoll opts out while Loughrey is on the mend. CORK ARE SET to have to plan without three players for their Munster football championship opener with the semi-final clash likely to come ‘too soon’ for 2017 captain Paul Kerrigan and Sean Powter as they rehabilitate from injury while Barry O’Driscoll has opted out of the inter-county setup. Powter has been sidelined since injuring his hamstring in the league opener against Tipperary in January. Kerrigan damaged his finger during Nemo Rangers club campaign and had to undergo an operation in the wake of their All-Ireland final loss. His club mate O’Driscoll has decided not to rejoin the Cork squad after a long campaign that culminated with that St Patrick’s Day defeat to Corofin. “I think the game will come too soon for Sean Powter and for Paul Kerrigan,” remarked Cork boss Ronan McCarthy. “Paul – it’ll be too soon for him I’d think though we haven’t ruled him out. “It’d be a major surprise, though, if Sean Powter and Paul Kerrigan play any role in the Tipperary or Waterford game. “Barry’s opted out so he won’t be with us. Look, we laid our cards on the table, we wanted him to be there and he said he wanted to opt out. We’ll move on. 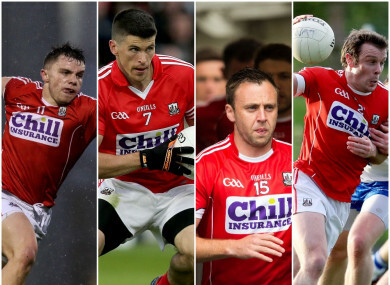 The flipside for Cork is that Aidan Walsh, James Loughrey and Brian Hurley have all made strides in shaking off injury problems while McCarthy did not rule out the prospect of Brian O’Driscoll featuring at some stage during the 2018 campaign. Walsh damaged his shoulder in Kanturk’s All-Ireland club intermediate hurling final in February, Loughrey has been hampered by an ankle injury while Hurley and O’Driscoll both have been suffering with hamstring problems. “Brian (O’Driscoll), we’ve had a bit of a roller-coaster in that he was out and gone for the season, and then there was a possibility he’d be back. “At the moment we’re going to delay the operation and he has some chance of being involved, an outside chance, I’d say, but we’ll see over the next couple of weeks. But we wouldn’t rule him out for the year yet. “It’s a hamstring injury but just more complicated than a standard injury. He’s been in London, he’s gotten the best medical advice, but we’re just a bit uncertain. “If he had a bit of luck – and he deserves it, because he’s put in a huge effort to get back after a serious shoulder injury – we’ll give him every chance to play some part in the championship. “Brian (Hurley) has come a long road. He played against Galway last week in a challenge and it was a real bonus for us. I felt he was going to be later in the summer before we’d see him, but we have to be careful as well. “Let’s not lose the run of ourselves – it was 25 minutes of a challenge game, so we’ll watch him and monitor him, but it’s a bonus. “He has a tremendous attitude, it’s infectious in the group. He went into the game and the Galway full-back knew he was there immediately, I’ll put it that way, and people rise to that. “James (played) against Galway. That was his first game with us, he’d ankle surgery and was going through his rehabilitation through the league. Email “O'Driscoll opts out for Cork and mixed injury news before Munster semi-final”. Feedback on “O'Driscoll opts out for Cork and mixed injury news before Munster semi-final”.